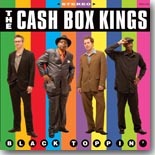 I just threw the new Cash Box Kings disc, Black Toppin’, into my CD player and I thought it was going to have a heart attack. Black Toppin’ is easily the most lively blues disc I’ve listened to all year, and kudos to Joe Nosek, Oscar Wilson, Kenny Smith, Joel Paterson and all of the honorary Kings for putting out an amazing record. Their dedication to the 1940s and '50s post-war Chicago blues sound, coupled with their Delta influences from the ’20s and ’30s has resulted in a disc that should garner them more Blues Music Award nominations for next May’s show. This is one disc that will definitely be in my top 10 at the end of the year, so hang on for a wild ride. We start out with “Blues Falling Down on Me,” an original song by Joe Nosek. Here we find Joe anticipating some trouble headed his way. “Three o’clock in the morning…coming without a warning…that’s when the blues are falling down on me!” All of this of course is female related and it’s up to Joe to navigate his way through it all. Oscar Wilson takes the mic for out next cut, the title track, “Black Toppin’.” Joe’s harp and Kenny’s drumming kick the tune off and here we find that Oscar is ready to hit the road. Black Toppin’ means that Oscar is crossing the bridge, heading over to the other side of the river to hook up with a woman he’s in love with. “I’m going black toppin’…I’m going black toppin’!” It’s his mistress across over the river and heaven help Oscar if his women finds out! Compatibility is an issue for Joe as well, and he covers it in “Trying Really Hard (To Try and Get Along with You).” It’s a struggle and Joe’s doing his best to make it work. “I’m trying really hard now…to just get along with you!” Hard to say how long it will last but he’s been in the relationship for almost a year now. Jump blues is the flavor up next and the band tackles it in “Oscar’s Jump.” Jerry Devivo’s sax is prominent here and the dance floor is moving. “We’re going to dance the boogie woogie…maybe some electric slide…this is ours to jump…do it 'til you're satisfied!” A lively tune and very well done by the Cash Box Kings. The tempo slows down considerably as the band moves on to “Money, Marbles & Chalk.” Here we find Oscar full of himself a little bit. “Now you know…I got a little woman…she got money, marbles and chalk…you know she bought me a fine Cadillac…that’s why I don’t have to walk!” Oscar seems to be a well kept man at this point and hopefully he’ll avoid the other temptations offered up to him. Joe’s back in love and tells us all about in “My Tina!” “I love my Tina…I love my Tina…better than I love myself!” He’s bound and determined to marry this girl, so hopefully he’s not headed for a fall. From top to bottom, Black Toppin’ is a great disc. The band’s performance is stellar and their playing is augmented by guest appearances from some of Chicago’s finest: Billy Flynn; Mark Haines; Gerry Hundt; Barrelhouse Chuck; Jerry Devivio and Alex Hall. It all makes for a great recording and one that would be an excellent addition to your collection. You can grab one from CBK at a live performance, their website (www.cashboxkings.com) or hit up Blind Pig’s website as well. And hopefully we’ll also see the Cash Box Kings well represented in Memphis for the BMAs next May!